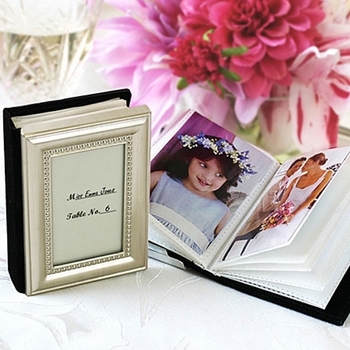 Every family wants to preserve those precious memories in life - this photo album favor is an ideal way to relive those milestone moments. Artfully decorated with a beaded silver metal front cover, it holds 24 wallet-sized photos (and the cover frame makes 25). The frame comes with a pre-printed, ready-to-personalize table card. This gift measures 3� x 4.� It makes a thoughtful and practical baby shower party favor. Please note that the minimum order is 24 items.